Last spring proved a fruitful one for both the men’s and women’s golf teams, bringing a slew of top five finishes and even tournament victories. The men, led by 2010 All-NESCAC selection and captain Nate Belkin ’12, were buoyed by the emergence of several young players last season. While the Jeffs missed qualifying for the NESCAC Championship in the fall, Nicolas Koh ’14 made a statement with his impressive performances throughout the season. He finished second of 118 players at Middlebury and third overall at the NESCAC Championship Qualifier to earn All-Conference First Team honors. Josh Moser ’15 also showed promise in the fall, earning Amherst’s MVP award for the Mountain Valley Cup Challenge. The team came together in the final two events of the spring, most notably earning perhaps the biggest victory in program history by defeating Williams and Wesleyan to bring the Little III Championship back to Amherst. So far this fall, the Jeffs finished seventh out of 12 teams at the rain-shortened Trinity Invitational on Sept. 8-9. Koh led the Jeffs with a two-day total of 114. The Amherst squad did finish ahead of conference rival Wesleyan, but they were unable to hold off the host Bantams, who took home the top spot in the tournament. As the Jeffs’ season gears up, Koh and Moser should continue to lead the squad, and the development of the current players will be supplemented by the addition of first-year James Line. If Koh and company can continue to build on the spring, a strong fall season is in store for the Jeffs. The women’s team enjoyed even better results than their male counterparts last season, finishing in the top three of every tournament they played. Despite the absence of top players Liz Monty ’13 and Irene Hickey ’13, both of whom were abroad in the fall, the team earned two third place finishes and a second place finish. 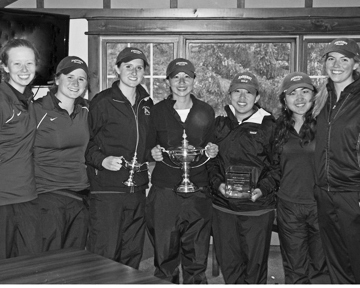 This year’s team will miss the contributions of departing graduates Laura Monty, Nina Yoo and Elaine Lin ’12, who helped to keep the ship afloat during the difficult fall without Hickey and Liz Monty. When the spring rolled around, the Monty sisters both enjoyed excellent seasons and spurred the Jeffs to a pair of tournament victories and one third place finish. Liz Monty placed second at the Vassar Invitational to help Amherst best rivals Williams and Middlebury, and Laura Monty won the Jack Leaman Championship Individual Title as a part of a first place team finish. This year, Hickey and Liz Monty will captain a young team that features four first-years and a pair of sophomores. While the captains have the talent to lead the team effectively, the Jeffs will need their young players to learn the ropes of the college golf landscape quickly if the team intends to maintain its spot near the top of the NESCAC.